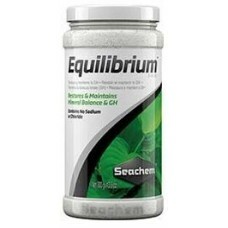 Equilibrium™ is specifically designed to establish the ideal mineral content for the planted aquarium. Equilibrium™ contains no sodium or chloride (which can be detrimental to a planted aquarium at elevated levels). Equilibrium™ is ideally suited for use with RO (reverse osmosis) or DI (deionized) water or any mineral deficient water. Equilibrium™ raises the essential mineral/electrolyte content (General Hardness) of the water to balance with and promote stability of the carbonate hardness. To maintain KH, we recommend Alkaline Buffer™. To raise mineral content/general hardness (GH) by 1 meq/L (3 dH), add 16 g (1 tablespoon) for every 80 L (20 gallons) when setting up an aquarium or when making water changes (add to new water). Equilibrium™ can be added straight to the new water, although for optimum solubility we recommend mixing with ~ 1 L (1 qt.) of water (the resulting mixture will have a white opaque appearance). When this mixture is added to the aquarium it will impart a slight haze that should clear within 15–30 minutes. HINTS: Do not use Equilibrium™ when replacing evaporated water. This dose is based on DI or RO water; for other water, measure hardness (GH) first and then add according to need. Plant preferences vary, but a general guide is about 1–2 meq/L (3–6 dH) or match the existing or target carbonate hardness (KH), which, ideally, is also about 1–2 meq/L (3–6 dKH).